Public Bicycle Schemes are a great way to popularise the use of bicycles among the youth as well as working professionals. Ranjit Gadgil, Programme Director, Parisar, a Pune based NGO, discusses these schemes around the world and the challenges in implementing them in India. A study by the Ministry of Urban Development in 2008 revealed that cycling had dropped from nearly 30% in 1994 to less than 11%. Decrease in safety due to increase in traffic volumes, inadequate cycling infrastructure, increasing trip lengths, greater incomes & affordability of personal motorised vehicles and low status are some of the key factors leading to this decline. Transport experts however, believe that boosting cycling is one of the best ways to address congestion, reduce pollution and improve the health of citizens. The National Urban Transport Policy (NUTP) of India has recognised this decline in cycling in cities and has realised the importance of cycling — both as a non-polluting and a cheap mode of transport. It has, therefore, made strong recommendations for creating cycle tracks and streets that are shaded and well-lit for cyclists, and for providing safe bicycle parking facilities. 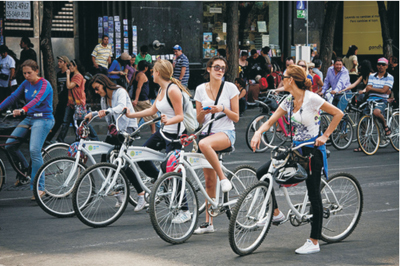 In addition, it has also advocated the taking up of public bicycle schemes by the cities. Normally people ride their own bicycles, or those that are borrowed or rented. Indian cities have a long tradition of rental cycles, one that is also on the decline. But many readers will remember how they probably learned to ride a cycle on a rented bicycle. Today most of the cycle rental shops are located in low-income areas, catering to the needs of working class people who still often need a rental cycle as a temporary need or replacement. These shops typically have the ?standard Indian gents black cycle?, with some smaller models for children. Cycles are rented out on an hourly or daily basis on a ?trust based model?. A public bicycle scheme, on the other hand, differs fundamentally from this rental model. A modern public bicycle scheme consists of ?cycle stations? located throughout the city. Once you become a member, you can ?check out? a cycle at any one of these stations and then return it at any cycle station. This way, you have access to a cycle when you need it, where you need it and for as long as you need it. The cycles are specially designed to be unisex, low-maintenance and sturdy. China has taken up public bicycle schemes in a big way. Hangzhou today boasts the largest such system in the world with a staggering number of 65,000 cycles at almost 2500 cycle stations. The idea of public or shared cycle schemes dates back to the 60s when a project of this kind, called the ?White Cycles?, was launched in the Netherlands. Cycles were simply available as a sort of publicly shared property. The idea was to use and leave them, so that anyone else might be able to use them too. This ?first generation? project however failed; too many cycles were stolen or vandalised. Building on this idea, more sophisticated schemes emerged later. These required membership to use the cycles and specific locations where they could be picked up and dropped off. User charges were also introduced, more to incentivise short use trips, than as a source of revenue. A public bicycle scheme works best when people return their cycle as soon as their trip is over so that another member can use it. Typically, the first half an hour or hour is free in such schemes and is then followed by increasing charges. In 2007, Paris launched its city-wide scheme, called V?lib? (cycle freedom) consisting of 18,000 specially designed cycles at over 1200 cycle stations. For a city not exactly known for its cycling culture (unlike many Scandinavian cities), it was a big hit. Some of the features of this next-generation system included a well organised repair and maintenance schedule as well as a sophisticated re-distribution system. The latter is crucial since in such large schemes one often finds cycles accumulating at certain stations, leaving the other stations (and members) without any. Real-time tracking of cycles at each station allows the central command centre to monitor and re-distribute them as required. Since the huge success of V?lib?, many other large cities have launched or plan to launch such city-wide systems, thus creating yet another public transport system to complement their bus/rail based systems. 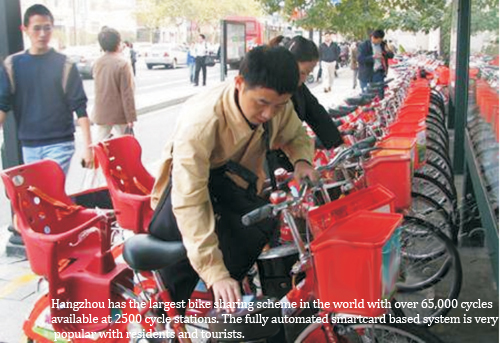 China, in particular, has taken up public bicycle schemes in a big way. Hangzhou today boasts the largest such system in the world with a staggering number of 65,000 cycles at almost 2500 cycle stations. The system has been a tremendous hit with the people of Hangzhou and has helped the city to relieve congestion and pollution, and also cater to tourists. Shanghai and Guangzhou (which also has one of the biggest Bus Rapid Transit systems in the world) too have followed suit. In addition, London, Barcelona, Lyon, Mexico City and Montreal are making up the 10 largest systems in the world while New York City, Chicago and Los Angeles are about to launch their own schemes very soon. In short, most of the ?world class? cities in Europe, USA and China have public bicycle schemes. The pilot public bicycle scheme proposal for Pune has a budget estimate of `9 crore for five years for a 300 cycle, 25 station system. Yet, for a city willing to spend crores on flyovers and road infrastructure, there is a political unwillingness to invest in such cycle schemes. Free cycle distribution finds greater favour, but does little to attract youth and middle-class to cycling who don?t see cycling as ?cool?. In recognition of the need to promote such schemes, the Ministry of Urban Development organised a workshop in Delhi in 2011 and invited NGOs, manufacturers, outdoor advertisers and government officials to discuss ways to achieve the same in India. Working groups were created to develop some specifications and toolkits which have recently been published, but two years later, in terms of actual projects on the ground, there is hardly anything to show for it.